The Bach family already counted several composers when Johann Sebastian was born as the last child of a city musician in Eisenach. After becoming an orphan at age 10, he lived for five years with his eldest brother, after which he continued his musical development in Lüneburg. From 1703 he was back in Thuringia, working as a musician for Protestant churches in Arnstadt and Mühlhausen and, for longer stretches of time, at courts in Weimar—where he expanded his repertoire for the organ—and Köthen—where he was mostly engaged with chamber music. From 1723 he was employed as Thomaskantor (cantor at St. Thomas) in Leipzig. He composed music for the principal Lutheran churches of the city, and for its university's student ensemble Collegium Musicum. From 1726 he published some of his keyboard and organ music. In Leipzig, as had happened in some of his earlier positions, he had a difficult relation with his employer, a situation that was little remedied when he was granted the title of court composer by King Augustus III of Poland in 1736. In the last decades of his life he reworked and extended many of his earlier compositions. He died of complications after eye surgery in 1750. In 1746 Bach was preparing to enter Lorenz Christoph Mizler's Society of Musical Sciences (de). In order to be admitted Bach had to submit a composition, for which he chose his Canonic Variations on "Vom Himmel hoch da komm' ich her", and a portrait, which was painted by Elias Gottlob Haussmann and featured Bach's Canon triplex á 6 Voc. In May 1747, Bach visited the court of King Frederick II of Prussia at Potsdam. The king played a theme for Bach and challenged him to improvise a fugue based on his theme. Bach obliged, playing a three-part fugue on one of Frederick's fortepianos, which was a new type of instrument at the time. Upon his return to Leipzig he composed a set of fugues and canons, and a trio sonata, based on the Thema Regium (theme of the king). Within a few weeks this music was published as The Musical Offering, dedicated to Frederick. The Schübler Chorales, a set of six chorale preludes transcribed from cantata movements Bach had composed some two decades earlier, was published within a year after that. Around the same time, the set of five Canonic Variations which Bach had submitted when entering Mizler's Society in 1747, was also printed. In January 1749 Bach's daughter Elisabeth Juliane Friederica married his pupil Johann Christoph Altnickol. Bach's health was however declining. On 2 June, Heinrich von Brühl wrote to one of the Leipzig burgomasters to request that his music director, Johann Gottlob Harrer, fill the Thomaskantor and Director musices posts "upon the eventual ... decease of Mr. Bach". Becoming blind, Bach underwent eye surgery, in March 1750, and again in April, from the British eye surgeon John Taylor. Bach died on 28 July 1750, from complications connected to the unsuccessful treatment. An inventory drawn up a few months after Bach's death, shows that his estate included five harpsichords, two lute-harpsichords, three violins, three violas, two cellos, a viola da gamba, a lute and a spinet, along with 52 "sacred books", including works by Martin Luther and Josephus. 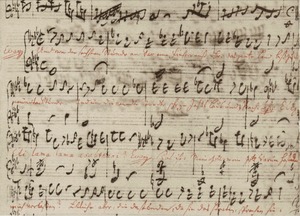 The composer's son Carl Philipp Emanuel saw to it that The Art of Fugue, although still unfinished, was published in 1751. Together with one of the composer's former students, Johann Friedrich Agricola, this son of Bach also wrote the obituary ("Nekrolog") which was published in Mizler's Musikalische Bibliothek (de), the organ of the Society of Musical Sciences, in 1754. To a large extent, Bach's musical style fits in the conventions of his day, which is the final stage of the baroque style. When his contemporaries such as Handel, Telemann and Vivaldi wrote concertos he did so too. When they wrote suites, he did so too. Similar with recitatives followed by da capo arias, four-part choral music, use of basso continuo etc. The specifics of his style lie with characteristics such as his skill in contrapuntal invention and motivic control and his talent for writing tightly woven music of powerful sonority. From an early age, he imbued himself with the compositions of his contemporaries and of prior generations, all of what was available from European composers, such as the French, the Italian, and those from all parts of Germany, and there is little of it that didn't appear in his own music. In the 21st century, Bach's compositions became available on-line, for instance at the International Music Score Library Project. High-resolution facsimiles of Bach's autographs became available at the Bach digital website. Websites dedicated exclusively to the composer or parts of his music include jsbach.org and the Bach Cantatas Website. What's the good word on Johann Sebastian Bach?